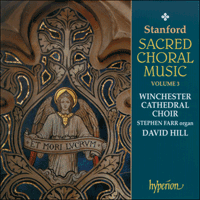 This is the third and final disc in Winchester Cathedral's survey of Stanford's sacred choral music. Several favourites here, including the dramatic For lo, I raise up and the grand hymn St Patrick's Breastplate. The Coronation of George V on 23 June 1911 in many ways marked the commencement of Stanford’s final creative period. Although it would be inaccurate to say that his powers of composition were in decline, one could nevertheless claim with some justification that his standing and influence as a composer were being rapidly superseded by new musical tastes with which he had limited sympathy. The music of the European progressives—Richard Strauss, Reger, Scriabin and Schoenberg—was already beginning to establish itself in London’s concert programmes, and the works of his own pupils—Coleridge-Taylor, Hurlstone, Vaughan Williams, Holst, Bridge and Ireland—were rapidly gaining the attention of conductors such as Henry Wood, Thomas Beecham and Landon Ronald as well as the up-and-coming young stars, Adrian Boult and Hamilton Harty. One should also not forget that Elgar, whom Stanford had aided generously at the turn of the century, was enjoying his heyday with a series of masterpieces including the First and Second Symphonies, the Violin Concerto and Falstaff. All this served to push Stanford steadily into the background. His career as a conductor was similarly less vigorous in the years immediately before the war. He continued to direct performances of the RCM Orchestra and Opera Class, but his active relationship with Leeds came to end with his resignation as conductor of the Leeds Philharmonic Society in 1909 and, more rancorously, of the Leeds Festival in 1911. Stanford’s temperament is also the subject of legend. To those pupils of whom he approved and in whom he detected a natural instinct for technique (such as Coleridge-Taylor, Hurlstone and Howells) he could be abundantly encouraging; to others who took time to develop (such as Holst, Vaughan Williams and Ireland) or whom he professed to be unteachable (Gurney and Bridge), he could be formidable. As a colleague he was quarrelsome and reactionary; he could appear arrogant, inflexible, litigious and was quick to anger which, to his cost, often had a deleterious effect on his friendships: the silence with Elgar between 1905 and 1922 and the rift with Parry in 1917 are two striking examples. Part of the problem was that behind the mighty façade lay a deep-seated insecurity. Stanford craved recognition and approbation. He basked in his successes (such as the ‘Irish’ Symphony, Op 28, Shamus O’Brien, Op 61, and the Songs of the Sea, Op 91) but was bitterly hurt by his failures. In the 1870s and 1880s his astounding talent had promised much: many saw him as the ‘blue-eyed boy’ of British music, brilliant, ambitious, visionary, versatile and confident; but this great promise seemed to falter partly through circumstance and partly through the flaws in his own personality. At first glance his career seemed brim-full of honours: there was the triumph of the Cambridge Professorship in 1887, the honorary doctorates at Oxford, Cambridge and Leeds, his knighthood (in 1902) and membership of the Royal Academy of Arts in Berlin (1904). But he also had to contend with many personal disappointments. Although he conducted occasional concerts for the Philharmonic Society, he failed to secure the much sought-after conductorship, which went instead to Sullivan (and later to Cowen and Mackenzie); he was a candidate for the Directorship of the RCM vacated by Grove, but the College Council unanimously elected Parry (whose character Grove much preferred); on the appointment of Parry’s successor, Hugh Allen, in 1918, Stanford was deeply wounded at not being consulted; Trinity College, Cambridge never made him a Fellow; he hoped for an honorary degree from Dublin, his home town, during the Tercentenary of Trinity College in 1892, but the honour went to Parry, and by the time Dublin did offer him the degree in 1921 he was too ill to travel, and, as Plunket Greene remarked, ‘the bullets were already flying’, making Ireland an unsafe place. The strife in the country of his birth and the creation of the Irish Free State only added to his sense of disappointment and isolation, not least because he vociferously opposed Home Rule for Ireland and became an ardent follower of Craig, Carson and Ulster’s cause. Another major factor in Stanford’s insecurity was his constant anxiety over money. Unlike Parry and Mackenzie who were both salaried (Parry also enjoying the security of a wealthy background), Stanford was paid by the hour throughout his teaching career. He had campaigned for special recognition to the College, hoping for an annual stipend, but this was turned down. At Cambridge University he fell out with the authorities over his professorial stipend which amounted to only £200 per annum. With the outbreak of war in 1914 the number of his pupils fell away as did his regular income. Soon he was compelled to ask for a loan from his great friend, Robert Finnie McEwen, a wealthy music-loving Scottish landowner. This helped to stave off the financial crisis for a while, but, unable to afford the lease at 50 Holland Street, he was forced to move to less spacious accommodation at 9 Lower Berkeley Street (off Portman Square) in 1916, and even at the time of his death in 1924 he was planning to move again to somewhere less expensive. These pecuniary difficulties would also explain why Stanford regularly fought tooth and nail for every penny owed to him in royalties and fees and why the many surviving letters to publishers seem obsessed with money. And yet it would be wrong to perceive the last fifteen years of Stanford’s life as a period of degeneration. Between 1911 and 1924 he wrote some of his most impressive music. In 1915 he completed The Critic (or An Opera Rehearsed), Op 144, a setting of Sheridan’s play replete with clever parodies and satirized genres; it was performed with some success at the Shaftesbury Theatre in London on 14 January 1916 under Eugene Goossens, one of his many former pupils. The following year he finished what was perhaps his finest operatic venture, The Travelling Companion, Op 146, adapted by Henry Newbolt from Hans Christian Andersen’s fairy tale. It contains some magnificent music which one senses immediately from the prelude. The prelude was, however, the only part of the work that Stanford heard (given by the Royal Philharmonic Society under Albert Coates on 4 November 1920); the opera itself was not performed until after his death when it was taken up by the Liverpool Repertory Opera Company in 1925. One may also point to other fine orchestral works such as the Piano Concerto No 2, Op 126 (heard first at the American Music Festival at Norfolk, Connecticut in June 1915 but not heard in Britain until 1919 when it was performed at Queen’s Hall by Benno Moiseiwitsch to great acclaim) and the inspired Irish Rhapsody No 4, Op 141, a stirring expression of Stanford’s Unionist sympathies. In addition to the production of larger works, Stanford also continued to compose prolifically for the Anglican Church and here too there was certainly no sense of decline in quality or inspiration. His last major setting of the Morning, Communion and Evening Services, the Service in C, Op 115, composed in 1909, was widely admired for its thematic economy, notably in the Evening Canticles which remain the Service’s most popular element. In the Magnificat Stanford contradicted his standard interpretation of the scherzo (as found in the Services in B flat, A and G) and replaced it with a slow movement (normally reserved for the Nunc dimittis). In addition Stanford chose to apply a quite different structural model. Instead of previous ternary or through-composed designs, the ten verses of the text (Luke 1: 46–55) are divided into four well-defined sections. The first (verses 46–47) acts effectively as a form of exposition in which the opening idea (1) (‘My soul doth magnify the Lord’) and closing ideas (2) (‘For he hath regarded the lowliness’) and (3) (‘of his handmaiden’) are presented. The second section (‘for behold, from henceforth’, verses 48–49), beginning and concluding in the same manner as the first, varies in its tonal treatment and thematic change. But it is in sections three and four that Stanford brings his more subtle techniques of variation to bear. In section three (verses 50–52) we begin with the characteristic organ gesture, a tonic chord of C, but the choral material (‘And his mercy is on them that fear him’) is altered. With additional text (three verses instead of two) the sense of tonal development is also more elaborate, shifting to the dominant of E flat. The link with sections one and two is, however, strongly maintained through the clear restatement of the closing ideas, though even here Stanford locates idea (2) in the Neapolitan (‘He hath put down the mighty from their seat’) before settling on C with the cadential refrain idea (3). The trend of refined variation continues in section four (verses 53–55). The familiar organ chord is sounded once again, but this time it is not the tonic of C but a first inversion of the flat submediant. This signals a departure to more remote tonal areas (‘He hath filled the hungry with good things’), the recovery from which is made precipitately with a sudden progression back onto the dominant of C as if to emphasize the Virgin’s affirmation (‘As he promised to our forefathers’). Furthermore, at this juncture, Stanford rounds off his elegant form with ideas (2) and (3) (‘Abraham and his seed for ever’) in a manner to correspond closely with that of the first section, thereby creating a sense of recapitulation. The through-composed Nunc dimittis is essentially one seamless melody which depends principally on sequential treatment for its expansion. In addition to the opening thematic material, which also figures at its conclusion (‘of thy people Israel’), Stanford introduces a motif already familiar from the Te Deum and the Jubilate (‘For mine eyes have seen thy salvation’) which is absorbed into both the accompanimental and melodic fabric of the movement. Ye choirs of New Jerusalem, an anthem for Eastertide, was completed in December 1910 and published by Stainer & Bell the following year. The text is taken from the hymn by St Fulbert of Chartres translated by Robert Campbell and made famous through H J Gauntlett’s hymn tune ‘St Fulbert’ in Hymns Ancient and Modern. Stanford’s anthem is based entirely on original material which alternates between two contrasting thematic ideas, one in the major mode in a lilting triple metre (‘Ye choirs of New Jerusalem’), the other in the minor and in quadruple metre (‘Devouring depths of hell their prey’). In 1911 Stanford was asked to provide a setting of the Gloria for the Coronation of George V. The result, finished on 23 December 1910, was an elaborate offering for large orchestra, chorus, semi-chorus and soprano soloist. It was also used at the Coronation of George VI on 12 May 1937. In August 1911 the composer added other movements of the Communion Service and published the work as the Festal Communion Service in B flat, Op 128. Though intended as a work for voices and orchestra, the accompaniment was also arranged for organ. The ebullient opening choral progression, regal in effect and majesty, echoes that of Parry’s I was glad in its move from B flat to the dominant of C. Stanford, however, prolongs this imposing dominant for a pregnant moment, carrying us from the glory of heaven to the peace of earth before restoring B flat major once again. The design of the Gloria is ternary and Stanford reserved his best music for the lyrical central paragraph. Sung by the semi-chorus and solo treble, the atmosphere of prayerful supplication (‘have mercy upon us’) is captured in a wonderfully variegated choral texture where full chorus, duet, trio and solo all overlap phraseologically in a seamless harmonic environment free from cadential punctuation. The declaration ‘For thou art only holy’ is used for the chromatic transition back to B flat whose arrival (‘most high in the glory’) is marked by a return to the opening tempo. There then follows a closing statement of exultation in which, prior to the final ‘Amen’, Stanford momentarily transports us to E major (‘God the Father’) to give us a truly ecstatic glimpse of the celestial. Twelve years after his Irish contemporary Thomas R Gonzalvez Jozé had composed his own setting (to the tune ‘Tara’) of ‘I bind unto myself today’ (1890) for the Irish Church Hymnal, Stanford copyrighted his own version of the hymn of the Ancient Irish Church. Attributed to St Patrick the words (in a translation by Mrs Alexander) were arranged by Stanford to an old Irish melody which first appeared in The English Hymnal published in 1906. Known as ‘St Patrick’s Breastplate’, the muscular text is based on St Paul’s letter to the Ephesians, chapter 6 verse 11: ‘Put on the whole armour of God’. St Patrick’s Breastplate, which in 1912 was also arranged by the composer for organ, brass, side drum and cymbals, is a set of strophic variations in which the arrangement is continually varied chorally and accompanimentally. Verse 8 (‘Christ be with me’) diverges from the customary triple metre for an interlude in the tonic major. The final verse, in effect the doxology, returns to the minor for perhaps the most majestic variation, fertile in harmonic nuance and modal colour. Stanford’s three English Motets, Op 135, were composed in February and March 1913. Eternal Father is a setting of Robert Bridges’ final sonnet (No 69) from the collection The Growth of Love, published in 1876 (and enlarged in 1890), which attempts to paraphrase and combine the pastoral ideals of the Lord’s Prayer and Psalm 23. The sentiment of the poem, one of spiritual conviction, warmth and ardour, is reflected in the rich, yearning diatonicism of Stanford’s constantly building phrases, a trend which culminates in the line ‘By thee in paths of peace thy sheep be led’ and where comfort from the pain and anguish of earthly life is poignantly depicted in the serene closing bars. Completed on Easter Day (23 March) 1913, Glorious and powerful God uses the same text as that set by Orlando Gibbons for his verse anthem (of the same name) and indeed may have been Stanford’s source. Scored for four voices, and simpler in texture and scale, this motet explores a contrasting style of a cappella composition in which polyphony is rejected in favour of a more homophonic, declamatory manner akin to partsong. For lo, I raise up, Op 145, Stanford’s most dramatic anthem, was composed in 1914. Through the analogy of Habakkuk’s prophetic writings, Stanford sought to express his own sense of horror at the war, of its needless destruction and of future deliverance. This is powerfully evident in the first part of the anthem, set in F minor, in which the restless choral lines are tossed about by the turbulent (quasi-orchestral) organ accompaniment. Yet, although initially Habakkuk’s text (taken from chapters one and two) is infused with a sense of woe, its conclusion is concerned with hope and the fulfilment of God’s purpose. In the certainty that all enemies shall be vanquished with the establishment of God’s order, Habakkuk’s message is one of consolation, a sentiment that is affirmed in Stanford’s climactic cadential phrase ‘We shall not die’. Building on this declaration of spiritual confidence the momentum increases, animated by a sense of divine destiny (‘The vision is yet for the appointed time’) and an impassioned acclamation of faith (‘For the earth shall be filled with the knowledge of the glory of the Lord’) which is tempered only by the sudden and compelling stillness of the coda (‘But the Lord is in his holy temple’). Here the memories of violence and dread are dissolved in a vision of peace and awe. At the end of the war Stanford, whose health was in steady decline, was ordered by his doctors to spend the nights out of London, especially while German bombing took place in the capital. At the RCM he had, like many of his colleagues, experienced the trauma of seeing his finest pupils go off to the front. Even his own son, Guy, had joined up in 1915 as a 2nd Lieutenant in the 3rd Reserve Battalion of the Devonshire Regiment and had been posted to the front line during the Battle of the Somme in 1916. After developing appendicitis in late July, Guy did not fight again, but many of Stanford’s pupils were to be less fortunate, among them Bliss (wounded at the Somme), Moeran (severely injured in the head), Gurney (gassed at St Julien near Passchendaele) and Farrar (killed in September 1918 at the Battle of Epéhy Ronssoy). Others of Cambridge memory died late in the war, including Alan Gray’s two sons Maurice and Edward who were commemorated in Stanford’s Piano Trio No 3, Op 158 (1918). There was also, on 7 October 1918, only four weeks before Armistice, the unhappy news of the death of Parry. For years the two men had enjoyed a close friendship, but in recent times their relationship had become strained. Early in 1917 a serious rift occurred which Stanford bitterly regretted. Owing in part to his wife, who played the role of intermediary, the friendship was revived but scars remained. As a symbol of his affection Stanford composed his Magnificat in B flat, Op 164, for double chorus which was completed in September 1918. Unfortunately Parry died before the work was published the following year. As an indication of the composer’s regret, the piece bore the following inscription: ‘This work, which death prevented me from giving Charles Hubert Hastings Parry in life, I dedicate to his name in grief. C.V.S.’ In accordance with the a cappella orientation of the work, Stanford adopted traditional elements of motet style such as imitation and antiphony: yet, rather than espouse the sixteenth century wholesale, he instead looked to the eighteenth century, to the florid intricacy and counterpoint of Bach whose motets he knew intimately as the one-time conductor of The Bach Choir. One thinks particularly of the effusive eight-part Singet dem Herrn ein neues Lied (which Stanford conducted numerous times), but one cannot help also drawing a parallel with Bach’s own Magnificat whose vigorous opening and closing music seems to re-echo in the corresponding pages of Stanford’s work. In spending the nights out of London, Stanford lived at Windsor where, according to scholar, editor and church musician E H Fellowes, he regularly attended daily evensong at St George’s Chapel. Lighten our darkness was written as a special tribute to the choir in March 1918. Fellowes recalled that it was sung on one or two occasions at St George’s in that year, but after that it was forgotten. In November 1935 it surfaced after Fellowes was sent the manuscript score by Walford Davies. The intention then appears to have been a desire to publish it, but for reasons unknown the work remained in manuscript. On this premiere recording, the anthem is sung in an edition by Jeremy Dibble. The text is taken from the Third Collect of the Order for Evening Prayer, ‘for aid against all perils’ which, like its predecessor For lo, I raise up, seems to embody something of the composer’s own personal commentary on the war. Certainly the ‘perils and dangers’ of the night loom large, appearing to support Fellowes’ suggestion that Stanford ‘had the raids in his mind when setting this Collect’. More profound, however, are the passionate, full-voiced entreaties of the opening (‘Lighten our darkness’), while the imitative phrase ‘and by thy great mercy’ expresses a deep inner longing; but more emotional still is the last phase of the anthem (‘for the love of thy only Son’) whose fervent melody must surely rank as one of the most poignantly beautiful in all English church music of the period. After the war Stanford produced a number of large-scale works—among them A Song of Agincourt, Op 168 (1919), the Piano Concerto No 3, Op 171 (1919), the Concert Piece for Organ and Orchestra, Op 181 (1921) and the Irish Rhapsody No 6, Op 191 (1922)—but publishers showed little interest in them. Yet in the province of church music Novello and Stainer & Bell were still eager to add new works to their catalogues and Stanford, perhaps keen to secure additional royalties, produced a clutch of late anthems which included Veni Creator (1922), the three Anthems of Op 192 for Advent, Christmas and Easter, When God of old (1923) and, arguably the finest, How beauteous are their feet (1923). For the four verses of Isaac Watts’s hymn (published originally as six verses in Hymns and Spiritual Songs of 1707) Stanford contrives a sophisticated variation form based on the opening melodic idea D-E-D-B-C-D. This fragment is used to initiate each of the first three verses; on each repetition, however, the polyphonic treatment is subtly varied and the consequent material is also quite different. In the fourth verse (‘The Lord makes bare his arm’) the tonic minor temporarily brings a moment of gravitas to the proceedings together with an imitative exposition of the principal idea in augmentation; but this is soon dispelled by the return of the major mode, which, still retaining the melodic augmentation, underpins the uplifting conclusion.